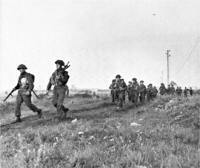 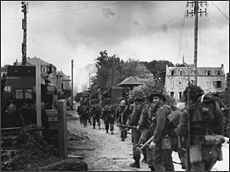 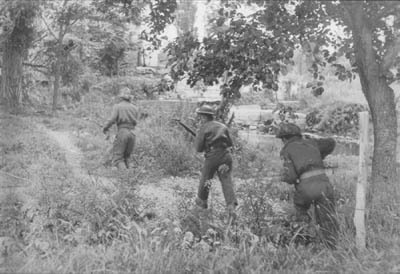 North Shore Regiment on patrol. 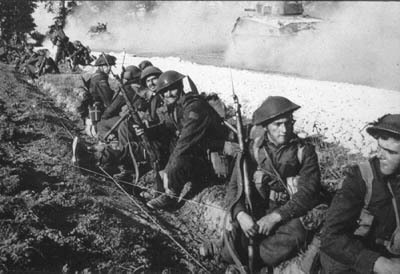 Soldiers of the 8th Canadian Infantry Brigade rest on the road to the front. 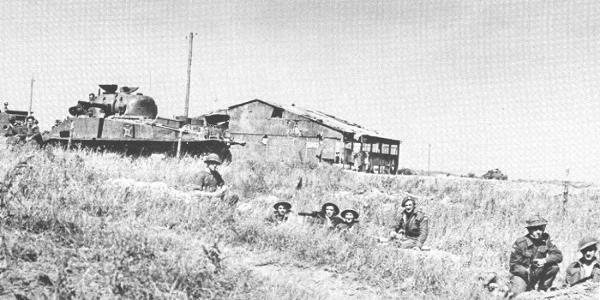 Soldiers of the Queen's Own Rifles dug in near Carpiquet with a Sherman tank in background. 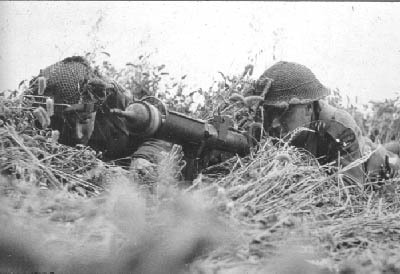 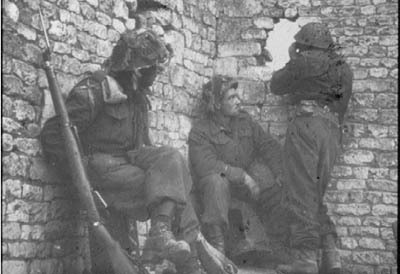 Soldiers of the Regina Rifles manning a Bren Gun. 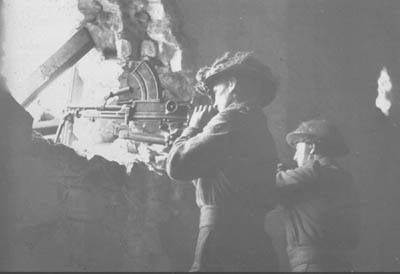 The Bren Gun was a .303 calibre light machine gun with a 30 round magazine. 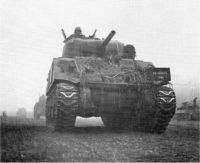 The Duplex Drive (DD) Tanks were Shermans with twin propellers and a collapsible canvas screen that provided floatation. The tanks would swim into shore and land with the charging infantry. When the tracks grounded on the beach the canvas sides were collapsed and tanks would be ready to fight. 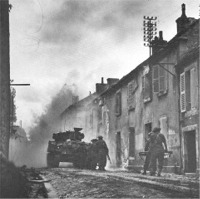 The Shermans were armed with a 75 mm gun and two .30 calibre Browning machine guns. Infantry advance with Sherman tank in the lead.. The Sherman tank was the workhorse of the Canadian Armoured Corps during the Second World War. The most widely used version was the M4A4 (Sherman V). 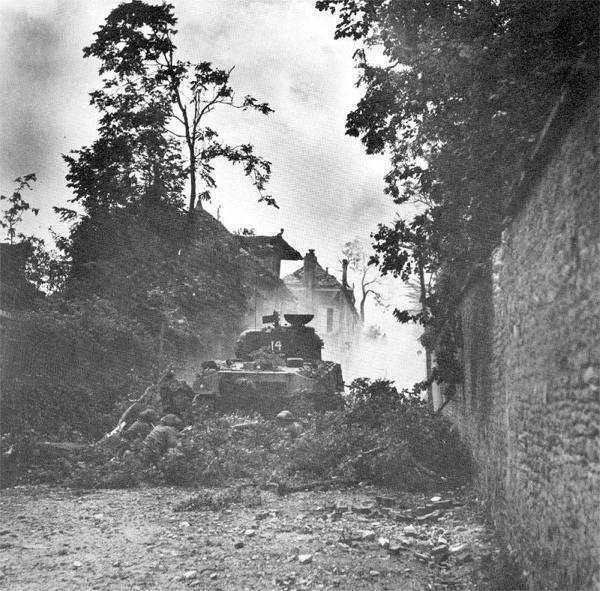 The Sherman had a crew of five: commander, gunner, loader-operator, driver and co-driver..
Infantry take cover behind Sherman during street fighting. Classed as a medium weapon, the Vickers gun could be fired at high or low angles from a tripod. 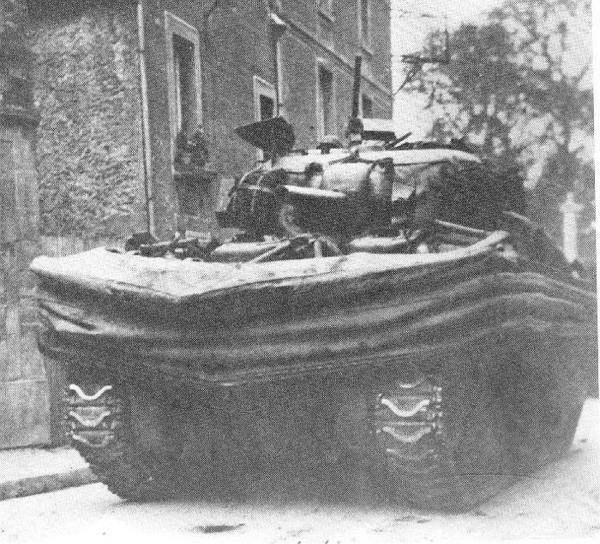 The Vickers was fed by 250 round cloth belts of .303 ammunition and fired in full automatic bursts of 10 to 20 rounds. 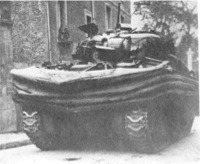 It could fire 60 shots per minute (slow fire) and 250 (rapid fire). 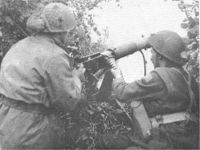 It was accurate up to 1100 yards.